INTERESTED IN SAMMY SINATRA & THE MAD MEN? Welcome to Fabulous Las Vegas! Well...sort of. 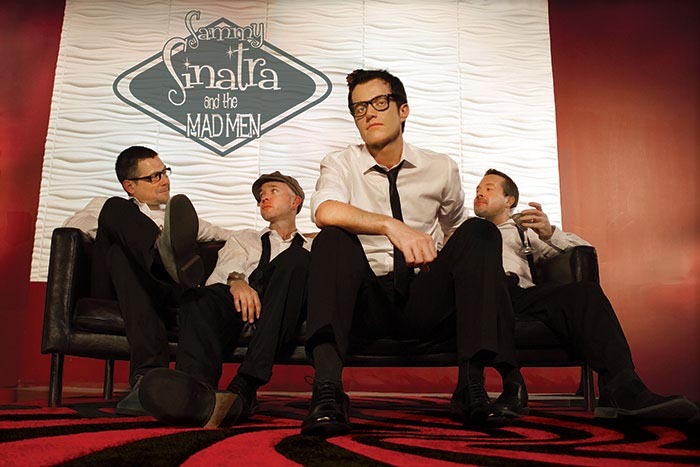 Sammy Sinatra and The Mad Men are the South's premiere Vegas style lounge act with a twist. You won't be hearing any Jazz standards at a Sammy Sinatra show, but instead you'll hear all the songs you know and love done in that Vegas lounge, Rat Pack style we all remember. Imagine if Dean Martin sang Ice Ice Baby or Sammy Davis sang Guns N' Roses. You get the idea. Inspired by legendary acts such as Richard Cheese and throwback TV shows like Mad Men. Sammy Sinatra and the Mad Men not only offer a unique musical experience, but are also over-the-top entertainers who will make your event a fully interactive affair. Your party will be a part of the show as Sammy is a true master of ceremonies who engages the crowd and dares you to have a great time! The song list of over 300 songs grows every week, but the band plays everything from AC/DC to Britney Spears to Jay-Z. Sammy will even throw an occasional TV theme song in the mix such as "The Fresh Prince of Bel-Air" or "The Brady Bunch" and many more. The show can be family-oriented or more adult. The material and set list can be configured to fit your needs. Sammy also has holiday themed shows as well! We urge you to listen to the sample clips and send them to your guests. One listen by your guests and the buzz and excitement will start to mount. Who doesn't want to hear a lounge version of "Pour Some Sugar On Me"?! Book NOW as dates are filling up and there isn't another option with this unique concept! Sammy Sinatra is guaranteed fun and will make your event a memorable one! Thank you for everything you did to make our Polaris parties a hit! it was a a great time and we couldn't be happier with the outcome.